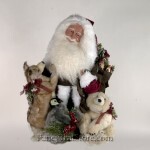 Shelie and Richard McCall began making Santa dolls in 1989 to give as gifts to their friends and thus began the art and passion that today is Stone Soup Santas. Creating these magnificent Santa dolls from their home on Mt. Tamalpais in Marin County California, the McCalls sell to gift galleries, doll shops and boutiques nationwide. Richard creates the forms: sturdy, freestanding wood-and-metal armatures and Shelie sculpts Santa’s polymer-clay head, hands and face. She also creates the costumes with fabrics that have a vintage feel. 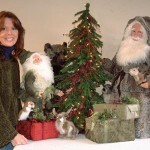 Every year Shelie and Richard create approximately 25 different Santas, each one set in their own unique scene dressed utilizing high-end plush toys, hand-crafted gift sacks, vintage style toys, sleds, baskets, canoes, snow shoes and snow dusted evergreens and branches to tell their story. Their passion for design is palpable in their unique and wonderful Santas.